I have been pregnant or miscarrying for the past eight months, and all that I have to show for it is a broken heart. As I’ve shared on my blog, I miscarried twice this year, making 2013 the unluckiest most miserable year of my life. Now I find myself in the strangely curious position of being pregnant for a third consecutive time. I find it ironic that it’s October with Halloween looming, as I wake up in the middle of the night from nightmares. Is this a trick or a treat? But this morning when I prayed, I had a vision of God. 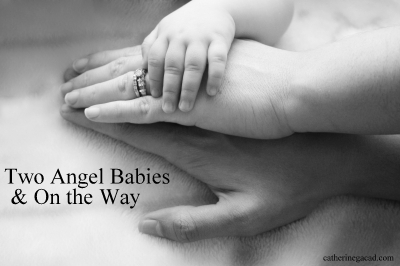 He was holding my two giggling angel babies—one on each arm, their brown bums on his lap. I reasoned, he doesn’t have room for another baby, so this one that I’m carrying must be the one for me. I felt sure in that moment that the one that’s currently in my womb—I will cradle in my arms. Some of you may wonder why I’m disclosing this—when we could very well end up in another similar situation. But I ask, who will pray for my child if I don’t say something? Why must I be robbed of the joy of sharing this news as a mother? That I have a life growing inside of me with a healthy heartbeat. How amazing is that?! I have harbored a great deal of guilt over the losses of my first two angel babies. Was the first miscarriage because I got sick during the pregnancy? Am I too small, too skinny? Did I do something wrong? Is God punishing me? I was so hopeful and confident that I’d get pregnant again, but when it happened, I couldn’t celebrate. I felt only dread and severe anxiety. Every time I went to the bathroom, I feared blood. Every day became an exercise in trying to overcome an overwhelming sense of dread and fear. But I cannot live like that anymore. While it is so much easier to wallow in sadness, I have been trying very hard to be positive. My new mantra is: Choose Happy. To wit, I was wrong when I started this post by saying I’ve been left with a broken heart. That couldn’t be further from the truth. I have two angel babies watching from above. I have a husband who tells me every day I’m the best thing that ever happened to him. And we are surrounded by the love of family and friends. I may not have given birth, but I created life three times over, and we did it naturally. What an unbelievable feat. To my readers, can I ask for your positive vibes, warm thoughts, caring light, and prayers. Your support keeps us afloat. And last but not least, to the little one who matters more than anyone else at this moment. I have one word for you: FIGHT, FIGHT, FIGHT! I am sending so many good thoughts and prayers your way! Yes, such good thoughts your way! I announced my second pregnancy so early – I wanted people to focus good vibes on me. I wanted everyone to know. If things had gone wrong, I’d want the support of people. Many, many good wishes to this new life. How terrible that you have had two endure two already. Of course you want to take delight in this but of course it’s also hard given the past. They say positive energy can sometimes move mountains and I really hope it does that for you. Wishing you only the best news from here on out this time around. Oh dear, more tears at work Catherine! But this time tears of joy. 😉 I got a glowing light filling my whole body when I read that you are pregnant. Sending prayers and love and hope and positive vibes for a peaceful, thriving pregnancy. xoxo! When I got pregnant the 3rd time, I couldn’t really be overjoyed by the matter. And had to just take each day at a time. I was grateful when we got to the stage where she was kicking because she was able to remind me on a regular basis that she was ok and that we were ok.
A friend of mine relayed the story that after 3 miscarriages, on her 4th pregnancy she spoke to the little one inside her and said, “Baby, you’re going to have to help me get through this because I don’t know how”. Each day I woke up with worry, but did what I can to be present to each day she gave me and each day she gives me now. Catherine, I got (good) chills reading this. I was thinking about you yesterday while I was driving, and I just had a strong feeling you were pregnant. I never get feelings like that. Wow! I am sending a constant stream of positive thoughts and prayers your way – grow big and strong, little one! Very happy to read this and hear about it. I can feel your joy and concern. All good thoughts are being sent your way. Hugs!!! Sending thoughts and prayers of health, strength and well wishes your way! I’m sending my thoughts and prayers your way! Know that you have lots of friends and support out here! I have a good feeling about your vision! I am praying for you and you baby Catherine. You are perfect, and so is your baby. The anxiety can drive you crazy but trust in the Lord that it will all be okay in the end. Be grateful for each day and try to create a loving and caring environment for baby. Your vision is so right. Thank you for sharing with us, I know it must have taken a lot. You are strong and you are brave. xoxo. Hi! I am praying for you and your family, I know that your babies are with the Lord. God gave you that vision so that you will be at peace. The fear that you have in that process is not the Lord. I pray that you will have peace and as you try again the Lord will bless you. Thank you for sharing, you are a blessing to many. Love love love! I’m overjoyed for you and your family! Your body is amazing, your spirit is strong and your babe is a fighter. Thank you for sharing your story, for being so brave and for inspiring us. I will pray for your continued bliss and health! Contact me anytime if you want to talk supplements and complimentary practices. I learned a lot on the road to meeting my little one. Love you! Holding space for you all — angle babies, womb baby(ies), hubby, and Mother-to-be/writer of the post. I was reading Kate’s post on Another Clean Slate and saw your comment with the comment luv note about your recent post. When I say the title I screeched over to your site as fast as my little fingers could hit the keys! I have tears in my eyes and joy in my heart for you and your husband. I will storm the heavens with prayers for you and your family! Please take care, Catherine, and feel the love and prayers from your family and friends (including the virtual ones) covering you with a blanket of protection. I am beyond happy for you! I am praying for that baby fighter that you have. SO happy. Blessings. Praying, praying, and more praying for that sweet baby in your belly!!! I know from experience pregnancy after loss is intimidating and terrifying, but there’s hope! I have prayed for you and know beyond the shadow of a doubt that you WILL carry this baby to term. Keep me posted on the delivery date and gender. I know exactly how you feel when it comes to being joyful or fearful! I’m glad you chose to let others in and allow others to pray over you and your baby. I will be one of your prayer warriors for sure. I also love seeing how your heart is changing through this journey. Keep choosing happy. Catherine, I know your fear. I’ve been there 5 times. You want to be happy & grateful, but you are petrified at every turn that THIS will be where it ends. You find yourself examining your TP every time you pee because you just know that it’s going to come to an end. All I can say is that your attitude is great, and you just have to have hope. It’s not happening the way you want it to, but there has to be a reason for that. We may not know on this side why this is our story, but I believe, one day, it will all make sense. Praying for a strong, growing baby, and that your anxiety & fears would be alleviated. Hold onto the victories as your pregnancy progresses! They will keep you going! WOOHOO!!!!!! What wonderful news!! Yes, yes, I will be praying for you and little bean. Oh, so happy for you. It is hard to let others in on your journey but it is good for you. It’s so helpful to know that others know what you are going through and that you aren’t alone. Also, ask your Dr. About extra progesterone. I was told to take it after my miscarriage and I believe it helped me carry my second little one to term. Catherine, it is wonderful that you are pregnant. I’ll be thinking of you & sending positivity in your direction. YES you deserve to share and be happy! I am praying constantly for you that this is the one. My dear Catherine, you know that I am praying for you. I have been already and my efforts will not wane. This is wonderful news. Thinking of you and sending positive vibes your way. Saying a prayer for you and your little one. Such wonderful happy news! Sending you all my best thoughts!! Goosebumps, Catherine. You leave me covered in them. I am praying as much as I can for you, Dean, and your little one. I wish you a healthy and happy pregnancy. I want you to rejoice for this baby and to feel the exhilarating and exciting thoughts that this special time brings. XOXO my sweet girl. I am thinking of you. Congratulations on your rainbow pregnancy! I too have an angel baby in heaven. I remember being so many emotions throughout my rainvow pregnancy. Always afraid of blood (of which I had so much, even with this healthy baby) and always the fear. But through it all I also had hope, and I would visualize that sweet baby, healthy and whole in my arms, and that’s just what happened. He is now 5 months old, and my whole world. Good for you for not being afraid to talk about miscarriage. It is not something to be ashamed of. It is not your fault, and yes you want as much positive energy as you can get rooting for your rainbow. Grow sweet baby, grow!